You are here: Home>Archive>Olney Rugby Union Football Club>Olney rugby team photographs from 1877 to date>Olney RFC 25th Anniversary Mini and Junior Section 1972-1997: Under 12 Team Photo. 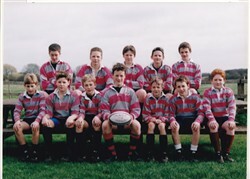 Olney RFC 25th Anniversary Mini and Junior Section 1972-1997: Under 12 Team Photo. Olney RFC Mini and Junior Section 1972-1997: Under 12 Team Photo.